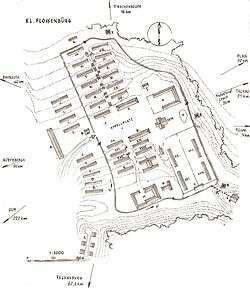 Hand-drawn plan of the Flossenbürg concentration camp by Stefan Kryszak, a survivor of the camp. 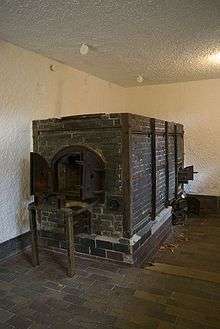 Konzentrationslager Flossenbürg was a Nazi German concentration camp built in May 1938 by the Schutzstaffel (SS) Economic-Administrative Main Office at Flossenbürg, in the Upper Palatinate region of Bavaria, Germany, near the border with Czechoslovakia. Until its liberation in April 1945, more than 96,000 prisoners passed through the camp, around 30,000 of whom died there. Before World War II, Flossenbürg was a men's camp primarily for "antisocial" or "criminal" prisoners. The camp's site was chosen so that the inmates could be used as slave labor to quarry the granite found in the nearby hills. The quarries belonged to the SS-owned and -operated German Earth and Stone Works (DEST) company. On 24 March 1938, SS authorities determined a site near the small town of Flossenbürg to be suitable for the establishment of a concentration camp due to its potential for extracting granite for construction purposes. During World War II, most of the inmates sent to Flossenbürg, or to one of about 100 sub-camps, came from the German-occupied eastern territories. The inmates in Flossenbürg were housed in 16 huge wooden barracks, its crematorium was built in a valley straight outside the camp. In September 1939, the SS transferred 1,000 political prisoners to Flossenbürg from Dachau. During World War II, the German army turned tens of thousands of Soviet prisoners over to the SS for execution. More than 1,000 Soviet prisoners of war were executed in Flossenbürg by the end of 1941. The SS also established a special camp for Soviet prisoners of war within Flossenbürg. Executions of Soviet prisoners of war continued sporadically through 1944. Soviet prisoners of war in Mülsen St. Micheln, a subcamp of Flossenbürg, staged an uprising and mass escape attempt on 1 May 1944. They set their bunks on fire and killed some of the camp's Kapos - prisoner trustees who carried out SS orders. SS guards crushed the revolt and none of the prisoners escaped. Almost 200 prisoners died from burns and wounds sustained in the uprising. 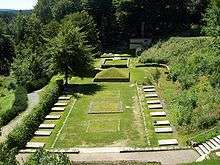 The SS transferred about 40 leaders of the revolt to Flossenbürg itself, where they were later executed in the camp jail. There were over 4,000 prisoners in the main camp of Flossenbürg in February 1943. More than half of these prisoners were political prisoners (mainly Soviet, Czech, Dutch, and German). Almost 800 were German criminals, more than 100 were homosexuals, and 7 were Jehovah's Witnesses. On 1 September 1944, Flossenbürg became a training camp for extremely large numbers of female guards (Aufseherinnen) who were recruited by force from factories all over Germany and Poland. All together, over 500 women were trained in the camp and in time went on to its subcamps. Women matrons staffed the Flossenbürg subcamps, such as Dresden Ilke Werke, Freiberg, Helmbrechts, Holleischen, Leitmeritz, Mehltheuer, Neustadt (near Coburg), Nürnberg-Siemens, Oederan, and Zwodau, and it is known that six SS women (SS-Helferinnenkorps) staffed the Gundelsdorf subcamp in Czechoslovakia. By 1945, there were almost 40,000 inmates held in the whole Flossenbürg camp system, including almost 11,000 women. Inmates were made to work in the Flossenbürg camp quarry and in armaments making. Underfeeding, sickness, and overwork were rife among the inmates. Combined with the harshness of the guards, this deliberate maltreatment killed many thousands of inmates. Amongst the Allied military officers executed at Flossenbürg were Special Operations Executive (SOE) agent Gustave Daniel Alfred Biéler (executed 6 September 1944). As Germany's defeat loomed, a number of the SOE agents whom the SS had tortured repeatedly in order to extract information, were executed on the same day. On 29 March 1945 13 SOE agents were hanged, including Jack Charles Stanmore Agazarian. Together with his deputy General Hans Oster, military jurist General Karl Sack, theologian Rev. Dietrich Bonhoeffer and Ludwig Gehre, Wilhelm Canaris was humiliated before witnesses and then executed on 9 April 1945. At the time of his execution, Canaris had been decorated with the Iron Cross First and Second Class, and the German Cross in Silver. On 1 August 2007 a memorial was unveiled at Flossenbürg to the memory of the seven members of the German resistance who had conspired to assassinate Hitler and who were executed on 9 April 1945. Prince Philipp, Landgrave of Hesse, German aristocrat, served as Governor of Hesse-Kassel as a member of the Nazi Party. He later fell out with the Party and was imprisoned at Flossenbürg in September 1943. Great-grandson of Frederick III, German Emperor and great-grandson of Queen Victoria. Camille Bedin, French politician and member of the Vichy 80. Wilhelm Franz Canaris, German admiral, head of the Abwehr (military intelligence service) 1935–1944 and member of the German Resistance (executed at Flossenbürg, April 1945). Hans Oster, German army general, deputy head of the Abwehr under Canaris and a primary plotter against Hitler (executed at Flossenbürg, April 1945). Kurt Schumacher, German social democratic politician, future head of SPD. Dmitry Karbyshev, former officer in the Russian Imperial Army, Soviet Red Army general, in 1943–1944. Ignacy Oziewicz, Polish general, the first commandant of Narodowe Sily Zbrojne. Dietrich Bonhoeffer, German Lutheran pastor and theologian, supporter of anti-Hitler conspiracy (executed at Flossenbürg; April 9, 1945). Rudolf Viest and Ján Golian, Slovak Generals and commanders of Slovak National Uprising were probably executed in Flossenbürg. Bertram James ("Jimmy" James), British RAF officer, survivor of the Great Escape. Marian P. Opala, Polish underground fighter, later a Polish-American lawyer who served as Chief Justice of the Oklahoma Supreme Court. Josef Kohout, pen name of the Austrian homosexual inmate Heinz Heger and subject of the book Die Männer mit dem rosa Winkel ("The Men With the Pink Triangle"). Jack Agazarian, British Special Operations Executive in France (executed at Flossenbürg, March 1945). Mieczysław Seweryn Mak-Piątkowski, political activist, Polish military officer and Polish Military Organisation activist. Jerzy Misiński, president of governing body for the sport of athletics in Poland - Polski Związek Lekkiej Atletyki (PZLA). Stefan Pomarański, Polish historian and scouting instructor, founder of Polish Scouting Movement. Marian Główka, Polish teacher and scout movement organizer in the Upper Silesia region, since 10.1933 Rydułtowy Regiment Scoutmaster, participant of "death march" from Hersbrueck to Dachau, after the World War II director and teacher in secondary schools in Bielsko-Biała, Poland. Three Italian Army general officers died in Flossenbürg: Major General count Guglielmo Barbò di Casalmorano (d. 14 December 1944), Major General Costantino Salvi (d. 17 January 1945), Brigadier Alberto Murer (d. 7 October 1944). Vaclav Valek, J.D, Czech lawyer from Prague, member of Sokol (athletic club). Vaclav Valek, Jr., Czech student of law at Charles University of Prague, son of Vaclav Valek, J.D. 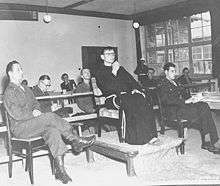 In early April 1945, as American forces were approaching the camp, the SS staged a perfunctory "trial" and executed General Hans Oster, Admiral Wilhelm Canaris, Rev. Dr. Dietrich Bonhoeffer, Dr. Karl Sack, Dr. Theodor Strünck and General Friedrich von Rabenau, who were involved in the 20 July plot against Adolf Hitler or previous plots against Hitler, along with the French Resistance worker Simone Michel-Lévy, who had managed to organize an uprising in the camp. On 20 April 1945, they began the forced evacuation of 22,000 inmates, including 1,700 Jews, leaving behind only those too sick to walk. On the death march to the Dachau concentration camp, SS guards shot any inmate too sick to keep up. Before they reached Dachau, more than 7,000 inmates had been shot or had collapsed and died. By the time the U.S. Army freed the camp on 23 April 1945, more than 30,000 inmates had died at Flossenbürg. Troops from the 2nd Cavalry Group, Mechanized, the 90th Infantry Division and the 97th Infantry Division found about 1,600 ill and weak prisoners, mostly in the camp's hospital barracks. Members of the army's Counter-Intelligence Corps, including Ib Melchior, Anthony Hecht and Robie Macauley, conducted extensive interviews with survivors to gather evidence for the 1946 Flossenbürg War Crimes Trial. The Flossenbürg War Crimes Trial took place in Dachau, Germany, from 12 June 1946 until 22 January 1947. An American military tribunal tried 46 former staff from Flossenbürg concentration camp for crimes of murder, torturing, and starving the inmates in their custody. All but 5 of the defendants were found guilty, 15 of whom were condemned to death, 11 were given life sentences, and 14 were jailed for terms of 1 to 30 years. On 22 July 2007, the sixty-second anniversary of the camp's liberation, a Holocaust museum was opened at Flossenbürg. The ceremony was attended by 84 former inmates, in addition to the president of Ukraine, Viktor Yushchenko, whose father was among the camp's inmates during World War II for five months. ↑ Joseph A. Rehyansky, "Flossenburg," National Review, 25 June 1976, pp. 678–9. ↑ Eric Metaxas, Bonhoeffer: Pastor, Martyr, Prophet, Spy, Thomas Nelson; (April 20, 2010), ISBN 978-1-59555-138-2. ↑ Papers of Major Ubaldo Pesapane, former Flossenbürg inmate, Archivio di Stato di Bolzano. ↑ Fischer, Benno. Death March: April 15, 1945 - April 24, 1945. United States Holocaust Museum Media Archive, RG-02.039. Republished as "Death March," edited by Peter Heigl, Nuremberg, 2011. ↑ "Robert W. Hacker, "Knocking the Lock Off the Gate at the Flossenbürg Concentration Camp; April 23, 1945," excerpted from Robert W. Hacker: Flossenbürg Concentration Camp, Phoenix 2000, unpublished manuscript. Flossenbürg memorial archive". 97thdivision.com. Retrieved 2012-05-17. ↑ "Memories of the chaplain to the US 97th Infantry Division at the online Museum of the division in WWII". 29 May 2011. ↑ "Anthony Hecht, obituary". Breakoutofthebox.com. Retrieved 2012-05-17. ↑ Macauley R. "Who Should Mourn?" The New York Times, Letters to the Editor, August 8, 1976. Cziborra, Pascal (2007). KZ Flossenbürg : Gedenkbuch der Frauen. : Memorial Book of the Women. Bielefeld: Lorbeer Verlag. ISBN 978-3-938969-03-8. Wikimedia Commons has media related to Flossenbürg concentration camp.